Hello friends and hello Monday! How did the weekend treat you? I never went to that canyon that I talked about, but I went Christmas shopping instead – which is so much more fun than working out! I almost finished all my presents in one weekend! How great is that? Have you started yet? You can actually start right know, because today I have 12 different ideas on Christmas decoration and gifts that you can make yourself. If you don’t have time, or just don’t feel like making your own Christmas decoration, you can buy everything you see above on Not on the High Street. 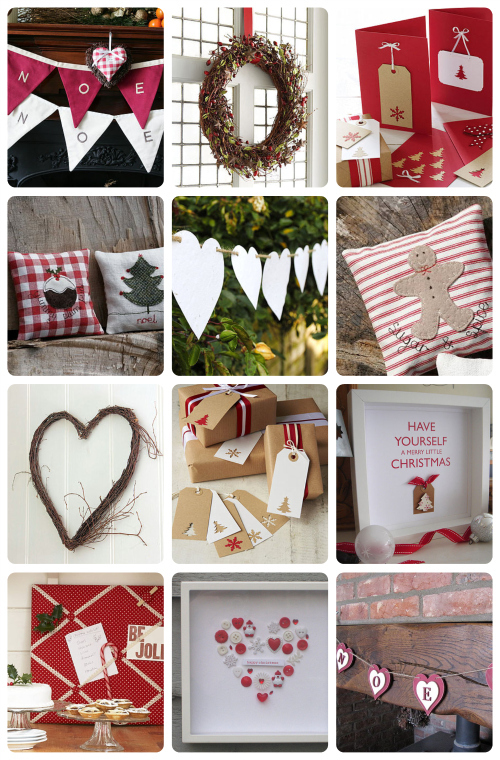 Do you usually make some of your own Christmas decoration or/and gifts? Wish you a great new week! Takk for mange gode ideer! Gorgeous collage of fantastic projects. You’ve got me all DIY excited. Thanks for the great ideas! Nå fikk jeg skikkelig julestemning, Nina!! Takk for det <3 Det hjelper også at det laver ned store fine hvite snøflak i Oslo 🙂 Åh, jeg elsker jul! Jeg skulle gjerne hatt massevis av tid til å lage personlige julegaver til alle jeg, men det har jeg jo ikke 🙁 Skal ha juleverksted med elevene da - det blir KOS! Gleder meg veldig mye til å se deg snaaart, og gi deg en STOR klem 🙂 Marthe. Deilig julestemning Nina. Og så flink du er som er nesten ferdig med julegavene. Jg har begynt, og til helgen har jeg planer om å ta et skikkelig tak. Det er jo så gøy. Ha en fin start på uka kjære deg. Tänk att jag blir så inspirerad VARENDA gång jag tittar in till dig! Så härligt pysselbord du har och så många stämplar, lovely! I didn’t know that shop, it has wonderful things!! I’ve just made a heart wreath that I will reuse it for Christmas! but hadn’t thought as far as decorations etc. I will definitely have a go now! I love the button heart! I have to take a look! Thanks! Another great idea for a christmas gift is a gift card from MetroFlats.com. Hei. Jeg synes det er stas med hjemmelaget, både pynt og gaver. Noe av kosen før jul det, alle forberedelsene, julekort, strikkeprosjekter, kakebaking og så videre. thank you thank you Nina! You know I was just talking to my friend about making xmas decorations. your post if perfect. I’m saving this so I can show it to her. thank you again! Love the inpinspiration for the holidays!! Will try some for sure !!! I adore this colour combination of red and grey. Very stylish. I would like to share some NY ideas as well.